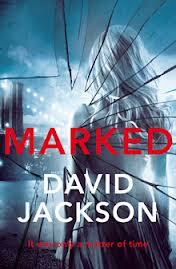 I have to admit to being a little apprehensive about approaching ‘Marked‘, the third in David Jackson’s New York set series featuring Detective Callum Doyle. The only reason for my concern was that I loved the first two books ‘Pariah‘ and ‘The Helper‘ so much I was dreading a fall or, at the least, a stumble on the sidewalk this time round. When the jacket image was released, expectations were very high indeed – the previous two novels read like great movies and this one looked like one straight away too, with its very cinematic and striking image. I closed the book just over an hour ago having started it this weekend for an 80 page session, followed by a tea and biscuits fuelled 290 pages marathon today (coffee and donuts were sadly unavailable) and I’m happy to report that Marked has definitely done its job: A top read, a great addition to the series and one that has left me desperate to read the next in the series to see just what Mr Jackson has in store for Doyle next. The character of Cal Doyle was pretty well drawn in the first novel and the follow up but, in Marked, the combination of his skills of sometimes unorthodox investigation and negotiation work, a killer sense of humour and his unshifting humanity towards victims and their kin, are all taken to the max – this is a crime fiction character who, as long as his creator allows, has a long future ahead of him. Background for the earlier novels is well woven into the book – new readers will have no real issue jumping in at this point but, if you do, you’ll be certain to then rush out and buy the first two anyway – so, go on, treat yourself to all three. I found the plotting within Marked incredibly well handled and played out, with a reveal sequence that was something Keyser Soze would be proud of. If I felt anything was missing in Marked it would have been that I got so caught up with the story and the characters that one of the other main characters, that of New York itself, seemed to step back from the spotlight a little – but I’m sure that it’ll all come to forefront again when we get to see Callum Doyle on the silver screen (come on – make it happen!). I took the day off from DIY at home today to read Marked but, after closing the book, it may be a while before I can look at my electric drill in the same way again. It’s with no irony that David Jackson has clearly ‘Marked’ his place firmly on the ‘crime writers to watch’ list with this one. Go get yourself in that New York State of Mind and soon. And for a great interview with David Jackson by Mel Sherratt – click here.